When Kaitlin Carpenter visited a nonprofit's website to make a donation, there was a box where she could make a comment as well. Thinking how cool it was that she could make a donation and also tell them why she supports their cause, Kaitlin took time to share a heartfelt story with them on why their work was important to her. Guess what they did with that information? Nothing. Absolutely nothing. And that is one of the worst things a nonprofit can do, especially when technology makes it easier than ever to connect with donors. Featured in this video clip, guest panelist Kaitlin Carpenter, Marketing Manager at Carousel30, starts off with the story summarized above and explains to nonprofits that the challenge is not to get donors to click the donations button once. Rather the challenge is to transform them from a one-time donor into a lifetime supporter. Kaitlin discusses how digital media can help nonprofits do this. The digital age has arrived faster than many predicted and has already disrupted practically everything it touches—from retail to transportation. Nonprofits also must adapt as the public expects worthy causes to offer the same type of online experiences they receive from others. 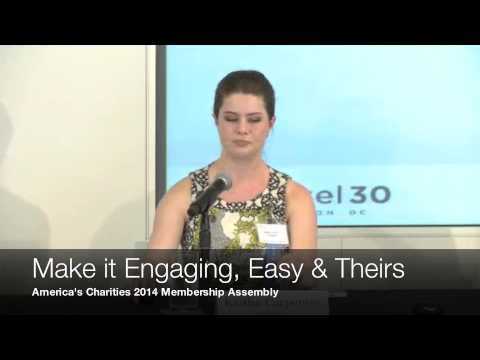 This panel discussion from America's Charities 2014 Membership Assembly addresses how innovative nonprofits are benefiting from online tools such as Twitter and LinkedIn to reach new audiences as mobile technology rapidly advances and Google Glass looms on the horizon. Panelists share best practices, offer tips to avoid pitfalls, and examine other ways digital advancements are expect to change our lives.